Medical-geographical description of the document containing the description of natural, economic and health conditions of a particular area, affecting the health of the population, the emergence and spread of human diseases. 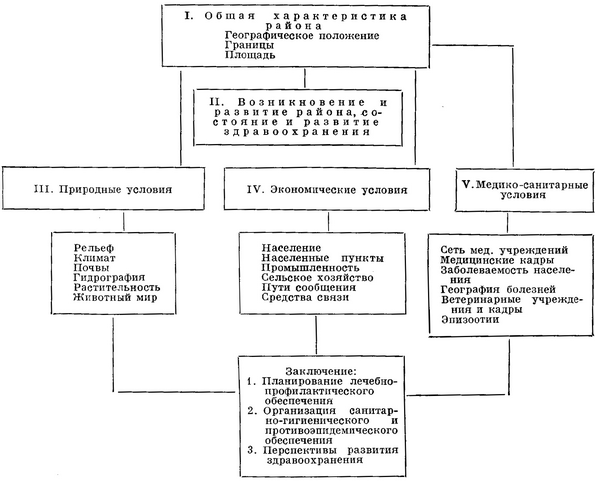 At the decision of many economic and practical problems of public health there is a need to study and the preparation of medical-geographical description of separate administrative territories of the USSR (district, province, and others). Independent objects of medico-geographical study can be the territory of the new industrial buildings, areas of development of virgin lands, large economic regions. The main task of medical-geographical study areas is to determine the impact of the whole complex of natural, economic and health conditions of a specific site on health, appearance and geographic distribution of selected diseases. On this basis, the necessary treatment-and-prophylactic and anti-epidemic measures, and planning recreational activities in the district, oblast, Krai. For the unity and continuity M-G. O. to be drawn up in a single program (see diagram). For all sections of the schema, you must have specific proposals directed to the improvement of the territory, preservation of health, prevention of emergence and spread of individual human diseases. Based on the study of the whole complex of natural, economic and health conditions in the region in conclusion should sum up the activities related to improving the health care of the population and the future of health care. Medical-geographical study area consists of collecting and studying the information about the individual elements of the natural, economic and health conditions, systematization and analysis of the collected materials, preparation of medical-geographical description. Gathering the required information can be done by examining various cartographic publications (geographical and medical-geographic maps and atlases); scientific works, characterizing the natural, economic and health conditions in the area and their influence on health of the population; the reporting of official documents by the planning authorities, health authorities and other institutions. Organization and carrying out of field of medical-geographical research will provide data that are absent in the literature, reports and other documents. Field studies give the opportunity to get acquainted with the nature of the typical landscapes, settlements, the status of therapeutic and other institutions of local health care. Collected from these sources summarize, compare, systematize, and then accompany the conclusions and recommendations of practical value to local planning authorities and health authorities. Medical-geographical descriptions are compiled by the health authorities with wide attraction of specialists of the sanitary epidemiological service, institutes of epidemiology, Microbiology and hygiene. M-G. O. shall be formulated briefly, clearly and at the same time to fully cover the given material. For this purpose it is necessary to widely use graphical methods in the display of individual information (maps, diagrams, graphs, tables, pictures etc). M-G. O. areas need to systematic verification and updating. Typical scheme of medical-geographical description of the area.